About Us - Santech Construction Corp. 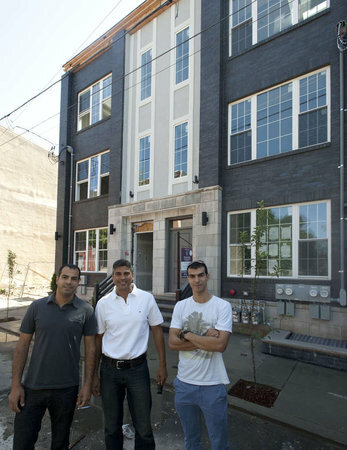 The Brothers Levi: In 2007, brothers Netanel and Shimon started a construction company in the Philadelphia area. For more than seven years, Netanel and Shimon have successfully worked with customers to improve their residential and commercial properties. In addition, they have worked together to buy, renovate, and sell various homes throughout the region. Over the years, Netanel and Shimon have developed long-term partnerships with supply vendors. They take pride in the quality of their work, and they look forward to working with new customers every day. As a Philadelphia, Pennsylvania general contractor and construction management company, Santech Construction Corporation, based in Wynnewood, PA, handles both new construction and renovations — with a special emphasis on kitchen and bathroom remodeling. From room additions and frameless glass shower doors to decks and complete interior home and business remodels, Santech is known to handle it all. Brother, Netanel is the president of this association. Once a week, held at the Santech Construction Office, the neighborhood gathers together for a meeting to plan on ways to bettering the neighborhood one day at time. For example, the association plans on events like “Help a Neighbor a Day.” Help a Neighbor a Day consist of improving homes in the neighborhood, installing new doors and windows before the cold weather starts. We know that remodeling projects require multiple areas of work. Just one small bathroom project could require framing, electrical work, plumbing, drywall and painting. As a licensed general contractor, Santech has experts to handle all aspects of the home remodeling process. The same proven tradesmen and service professionals are employed for each project we do. Our team includes licensed architects, local subcontractors and tradesmen, mechanical, structural, & electrical engineers, interior designers, office staff, and construction crew.